If you take a look into New Orleans’ charming past, you’ll find a bevy of historic haunts. From Preservation Hall to the famous Cafe Du Monde, important historic and cultural landmarks makeup a large part of the city’s presence. One site that hosts a significant part of the Big Easy’s history is the New Orleans Pharmacy Museum, located in the French Quarter. Listed under the National Register of Historic Places, the museum offers an expansive collection of pharmacy and healthcare artifacts in Louisiana. Serving as a unique educational tool and reminder of NOLA’s rich role in United States medical history. Louis J. Dufilho, Jr. was America’s first licensed pharmacist. Contributing to the significance, reputation, and integrity in the field of pharmacy, he played an essential role in medical history. However, his most significant contributed occured in 1816. Signed by Governor Claiborne in 1804, the state of Louisiana passed a law requiring that all pharmacists must take an examination for licensing to practice professionally. Previously, there were informal territory licensing measures that were not largely enforced. A person could apprentice as a pharmacist for 6 months and then make their own medicines and concoctions without any safety and standard practices or regulatory oversight. Often, the public received incorrect dosages or wrong and ineffective medications. However, the passage of the 1804 law established a board of credible pharmacists and physicians to administer three-hour oral examinations at the Cabildo in Jackson Square. As the first person to pass the licensing examination, Louis J. Dufilho, Jr.’s apothecary shop became the first pharmacy in the United States to operate on the basis of scientific adequacy. Today, the museum sits on the site of America’s first licensed apothecary. To further the history and interest into New Orleans and the medical history of America at-large, the museum proudly promotes the development and education of pharmacology history for the general public since 1950. 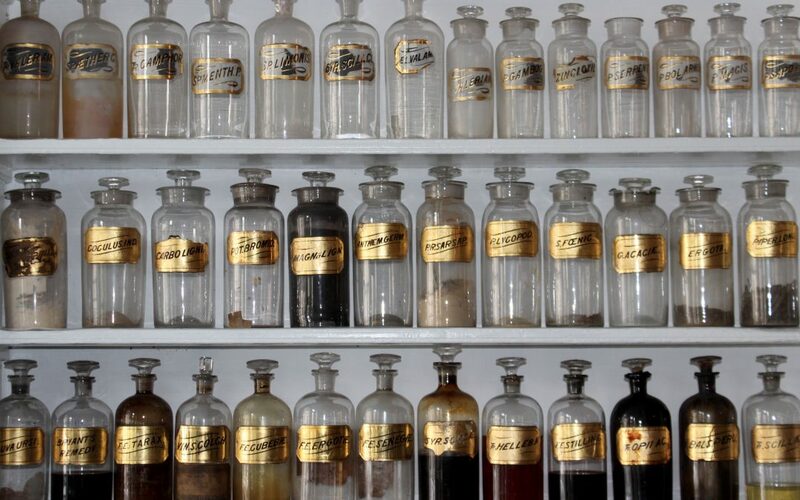 The museum holds over 3,000 artifacts and seeks to address the deep cultural understandings of medical issues at the time while helping visitors understand how pharmacology developed in New Orleans. The museum, also called La Pharmacie Francaise, is located in a townhouse On the first floor, the museum showcases artifacts such as show globes, opium, perfumes, cosmetics, “gris gris” voodoo potions, patent instruments, surgical instruments, administrative methods, prescriptions and compounding, and insights into questionable medical practices of the time. The second floor plays host to the unique living quarters and architecture of the building, local excavated medicine and voodoo bottles, and Dr. J. William Rosenthal’s spectacles collection. Among the museum’s most exotic findings, guests can see live leeches, pre-Civil War syringes, and cupping jars. Guests can also view what a physicians study and sick room looked like in the past. Many of the exhibits show instruments that are deeply tied to the culture and folklore of New Orleans’ diverse cultural heritage. In addition, a historic courtyard displays plants and herbs that were, and still are, often used in medicines. A carriage house, and loggia help give more clarity into the everyday lifestyles of people who used this building. Admission for the museum is $5 for adults and $4 for seniors/students. It’s also free for children under 6-years-old. The museum is open Tuesday-Saturday from 10 a.m. to 4 p.m. Located at 514 Charles St in New Orleans, all admission features a free 1 p.m. guided tour, except Saturdays. As one of the best museums in New Orleans, according to numerous travel sites, be sure to check out one of the most enchanting and introspective museums in NOLA’s cultural and historical landscape.